Russia-backed militants made 14 precision attacks upon Ukrainian troops in the combat zone over the last day. They fired 140 mortar mines of the 82-mm and 120-mm caliber. Russian proxies also shelled Ukrainian positions with 152-mm artillery. Ukrainian troops returned fire seven times with the weapons not proscribed under the Minsk agreements, reported Colonel Oleksandr Motuzyanyk, Ukrainian Ministry of Defense spokesman on ATO, at a press briefing at Ukraine Crisis Media Center. In Luhansk sector Russia-backed militants violated the ceasefire six times. All the attacks they made took place during the dark time of the day. “Most intense hostile attacks recorded were again the ones conducted upon Luhanske. The enemy made a long-lasting attack with 152-mm artillery as well as launched forty 120-mm mortar rounds and over twenty 82-mm mortar rounds. Militants also fired from an anti-aircraft cannon ZU-23-2, grenade launchers and machine guns,” Colonel Motuzyanyk added. Russian proxies mortared the area near Novoluhanske, Lozove, Zaitseve and Travneve. They fired over twenty 120-mm mortar rounds near Lozove and 16 mortar rounds near Travneve. In Donetsk sector Russia-backed militants opened precision fire upon Ukrainian troops eight times over the last day. In Lebedynske militants fired three times from 82-mm and 120-mm mortars discharging over 20 rounds. Other weapons in use included grenade launchers, machine guns and small arms. Russian proxies attacked the Ukrainian positions near Pavlopil with 120-mm mortars, near Hnutove – with IFV mounted weapons. “The enemy also fired from grenade launchers of various systems, machine guns and small arms upon the Ukrainian strongholds near Avdiivka, Shakhta Butivka and Kamianka,” the ATO spokesperson said. Ukrainian troops returned fire from grenade launchers and machine guns not proscribed under the Minsk agreements. 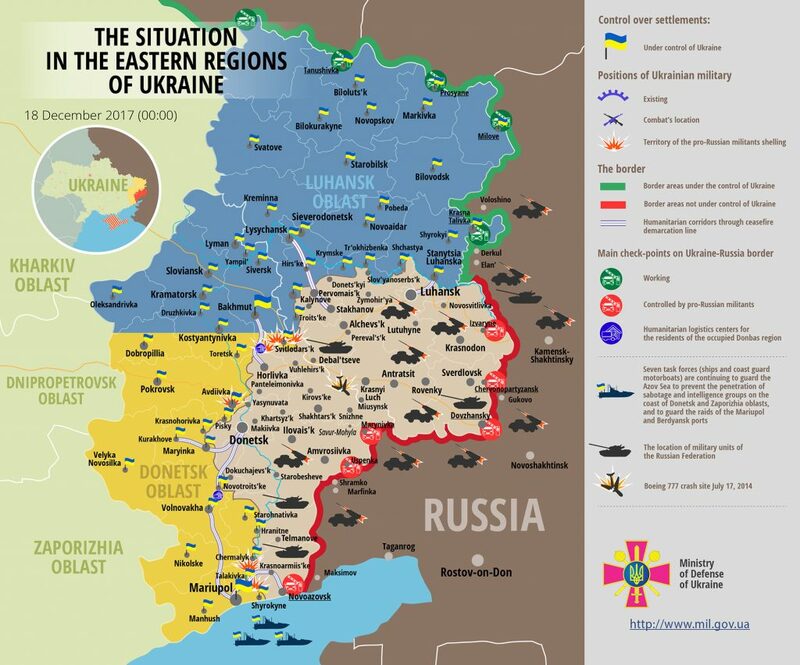 Three Ukrainian servicemen were killed in action over the last day. The incident took place outside Zaitseve at about 23:00 as a result of a hostile attack from 120-mm mortar. According to Colonel Motuzyanyk, Russia-backed militants may start an offensive along the entire contact line tomorrow. “As per the intelligence information, on December 19 following the statement of the Russian Federation Ministry of Defense declaring their intent to call back Russian officers from the Joint Center for Control and Coordination for ceasefire and contact line stabilization (JCCC), the enemy may start an offensive all along the contact line in the combat zone. Moreover in order to blame the violation of the Minsk agreements on Ukrainian troops, Russia-backed militants attack their own positions from tube artillery, launch rocket systems, tanks and other types of weapons available to them,” the ATO spokesperson said. Report on the military developments as of December 17 is available here. Interactive data on the shelling: chronology shelling chart and the interactive map.